Manufacturer claims 400-mile range, Level 3 autonomy for electric pickup. With a base price of $61,000, Rivian plans to go after affluent buyers who might consider vehicles built by Tesla or Jaguar Land Rover, company spokesman Michael McHale says. Electric-vehicle startup Rivian this week is showing off two new battery-electric vehicles at the Los Angeles auto show: a pickup truck that’s nearly production-ready and a prototype for an SUV crafted at the company’s engineering center in suburban Detroit. The ambitious startup is taking aim at both traditional manufacturers, such as Jaguar Land Rover, and newer companies such as Tesla that are invading the automotive business with BEVs. Rivian says its R1T pickup offers a unique blend of new technology and traditional automotive engineering with a focus on structure, while the R1S SUV (below, left) is being developed with the same mixture of technology and automotive craft. Both of what Rivian calls Electric Adventure Vehicles are to be built at the former Mitsubishi assembly plant in Normal, IL, starting in 2020. Rivian is headquartered in Irvine, CA, and has an R&D facility in San Jose, CA. The engineering center in an old industrial building in Plymouth, MI, where Burroughs Corp. once built adding machines and other office equipment, has been turned into a sleek technical facility housing more than 300 Rivian employees who are specialists in product design, automotive engineering and software development. One of the key reasons Rivian founder and CEO RJ Scaringe established the technical center in Plymouth was because he believed the Detroit-area automotive engineering community had key experience to offer. “We’re launching Rivian with two vehicles that reimagine the pickup and SUV segments,” says Scaringe, 35, who earned a doctorate from the Massachusetts Institute of Technology. MIT found his business plan attractive enough to put up some money for the startup, which he launched in 2009. “I started Rivian to deliver products that the world didn’t already have – to redefine expectations through the application of technology and innovation,” Scaringe says. “Starting with a clean sheet, we have spent years developing the technology to deliver the ideal vehicle for active customers. “This means having great driving dynamics on any surface on- or off-road, providing cargo solutions to easily store any type of gear, whether it’s a surfboard or a fishing rod and, very importantly, being capable of driving long distances on a single charge,” he says. Scaringe says Rivian has developed its vehicles with a spirit of adventure at the core of every design and engineering decision. “The R1T and R1S are the result of all this work and we are excited to finally introduce these products to the world,” he says. The 5-passenger R1T pickup and 7-passenger R1S SUV prototype on display at Los Angeles are engineered to easily wade through more than 3 ft. (1 m) of water with a fully sealed underbody. Rivian claims the EVs have a range of up to 400 miles (640 km) and feature Level 3 autonomy, or so-called hands-off/eyes-off technology enabled by radar, lidar, high-precision GPS and high-definition maps. Level 3 means the driver doesn’t have to maintain contact with the steering wheel or keep his eyes on the road until the system prompts him to take back control. 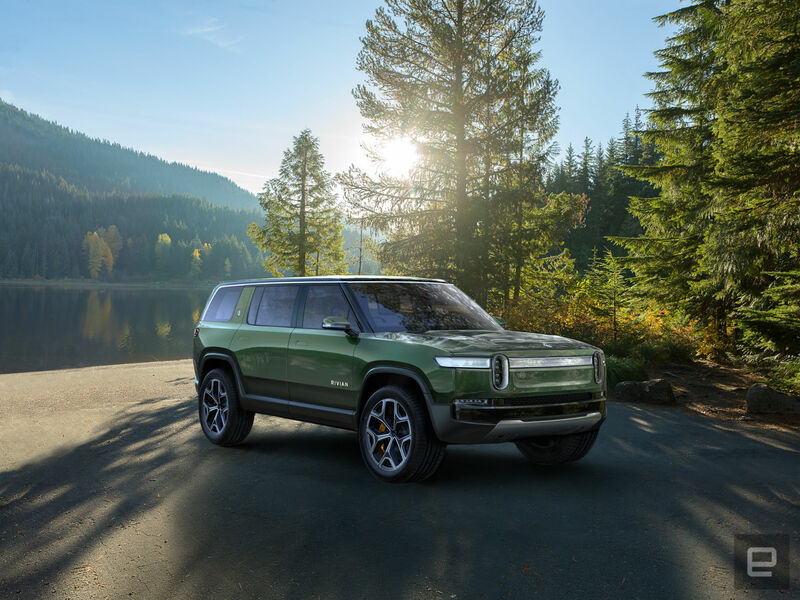 With a base price of $61,000, Rivian plans to go after affluent buyers who might consider vehicles built by Tesla or Jaguar Land Rover, says Michael McHale, the company’s communications director. Rivian says both vehicles can travel from 0-60 mph (100 km/h) in 3 seconds with zero emissions. Their quad-motor system, which places a 200-hp electric motor at each wheel, provides superior control both on the road and on steep rugged terrain off-road, Rivian says. “The beauty and elegance of our quad-motor setup isn’t just about brute power. This architecture provides instantaneous torque with extremely precise control at each wheel, which is completely game-changing from a dynamics perspective, both on- and off-road,” says Mark Vinnels, executive director-Engineering and Programs, formerly a top engineer at McLaren. The main bodyline of the R1T wraps up and around the cab and gives the pickup a distinctive silhouette while accentuating the rear fender flares. The R1T features short overhangs, high ground clearance and aggressive approach and departure angles for a confident and rugged stance, all enabled by Rivian’s unique skateboard platform, the company says. The platform holds the battery pack, drive units, suspension, braking and thermal system all below the height of the wheel, leaving the space above for occupants and their gear. Beyond the packaging benefits, this architecture delivers a low center of gravity that supports the vehicle’s agility and stability, the company says. The R1T pickup’s payload is 1,764 lbs. (800 kg), and its towing capacity exceeds 11,000 lbs. (5,000 kg), Rivian says. Rivian’s safety systems and body-structure design will deliver IIHS Top Safety Pick Plus and NHTSA 5-Star ratings, the company predicts. Safety features include eight airbags and reinforcement of the skateboard platform to protect the battery. In harmony with the exterior, Rivian says, its EVs welcome occupants into a warm, inviting environment that conveys craftsmanship yet invites rugged, daily use. Sustainably sourced wood is used throughout the interior. In high-wear areas the materials take inspiration from sportswear and active gear, combining durable and innovative materials that can easily be cleaned, the company says. “Although the exterior of the vehicle is what first attracts you, the interior is where you spend most of your time, so we really focused on creating a transformational space,” says Jeff Hammoud, vice president-vehicle design.